London-based artist Yinka Shonibare's Wind Sculpture V evokes a bolt of African batik fabric blowing in the wind. Mimmo Paladino's bronze sculpture Caduto a ragione (Fallen to the Ground) is a archaic bronze figure falling victim to the persistent pecking of a flock of birds.. There are two new additions on display at the Sydney and Walda Besthoff Sculpture Garden: Caduto a Ragione by Mimmo Paladino and Wind Sculpture V by Yinka Shonibare. WWNO’s Eileen Fleming met up with New Orleans Museum of Art Director Susan Taylor outside the garden to discuss the donations made by the Besthoffs. 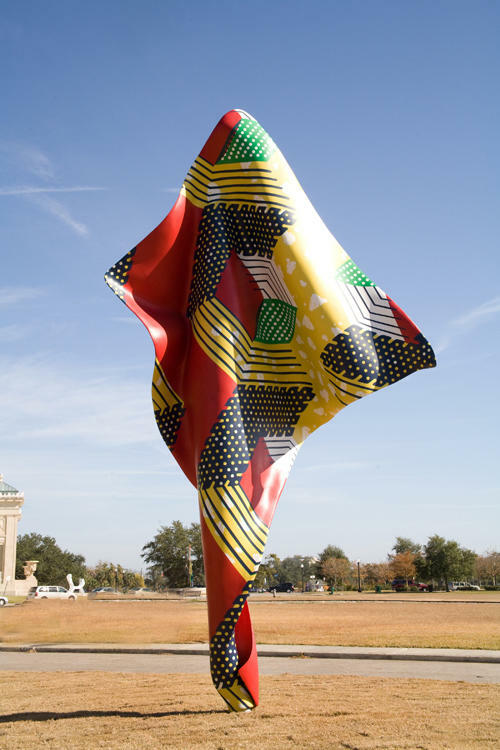 Shonibare's Wind Sculpture V is a majestic 20-foot tall resin sculpture evoking a bolt of African batik fabric blowing in the wind on a large scale. The sculptures reference the sails of ships, continuing Shonibare's exploration of maritime trade affecting cultural identity. Wind Sculpture V is installed in the grassy triangle to the south of the garden entrance. 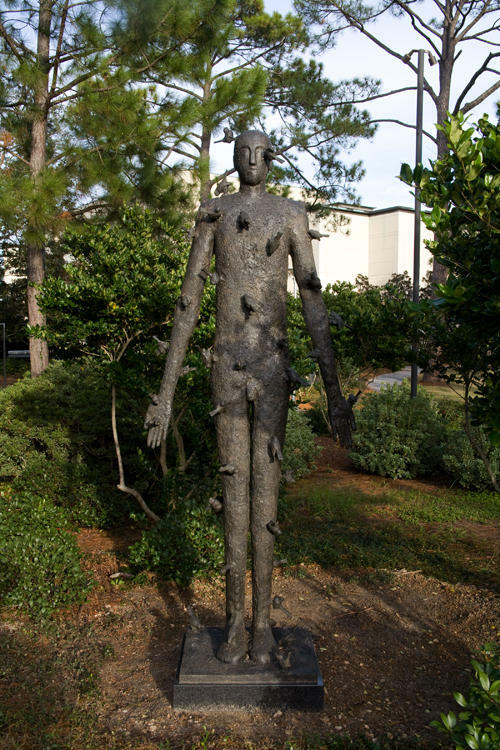 Paladino's monumental bronze sculpture Caduto a ragione (Fallen to the Ground) is an enigmatic, archaic bronze figure falling victim to persistent pecking of a flock of birds. Caduto a ragione is installed within The Sydney and Walda Besthoff Sculpture Garden, in the front section of the garden near the bridge over the lagoon. The sculpture garden is open daily from 10 a.m. to 6 p.m. It now attracts about 100,000 visitors a year. 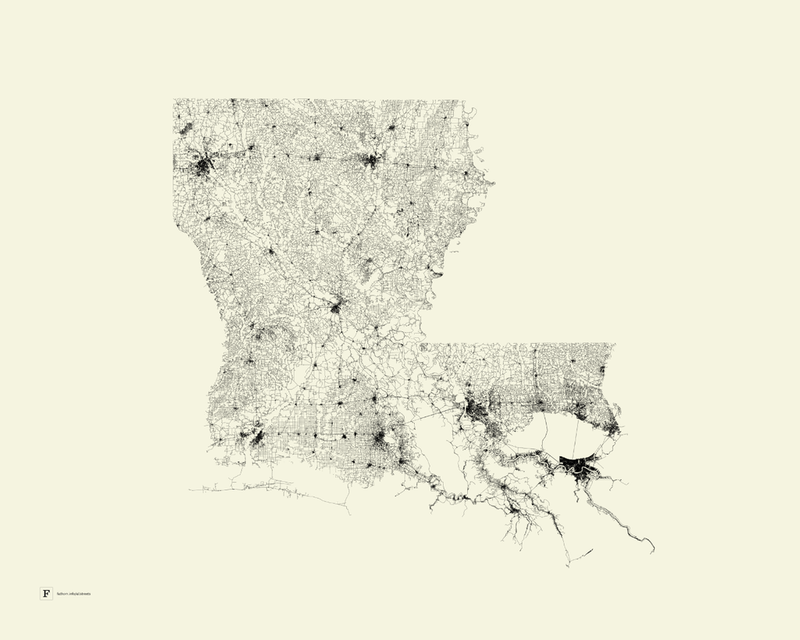 What's left of Louisiana if you strip away everything but the roads? Folks at the Boston-based design firm Fathom had a unique idea: what would maps look like if you stripped away all the defining features of a state, or of a country, leaving behind nothing but the roads? Even a regular road map retains the outline of a place, its peaks and valleys, mountains and rivers, the names we give the defining features. But what if we take all that away and just leave the connective tissue, the pavement, behind? 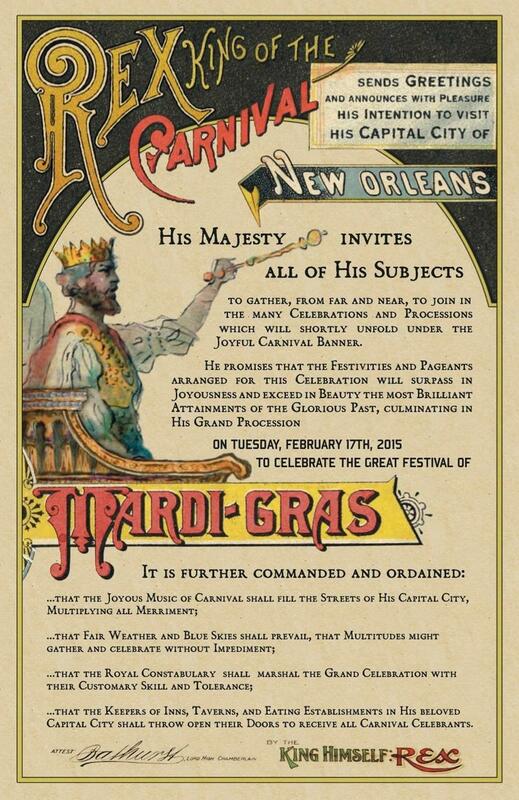 Continuing an annual tradition begun in 1872, Rex, the titular "King of The Carnival" here in New Orleans, issued a Royal Invitation on Tuesday inviting the world to come to the Crescent City and experience Mardi Gras.